I have been on Facebook since 2008. The pic above is how I looked back then. It has been a non-stop eight years until yesterday, February 28, 2017. Yesterday was Fat Tuesday, the day before Lent. Lent is the forty-day period before Good Friday and Resurrection weekend (Easter) where Christians (primarily Catholic) give something up to focus on God. People choose all types of things to give up: food, alcohol, cigarettes, soda, coffee, or chocolate. Whatever your vice in life is, you make a conscious choice to give it up for these 40 days. I equate it to a New Year’s resolution…with a lot more punishment involved. Giving up something for Lent, to me, is a form of punishment. You are declaring to yourself and your body, I am going to go cold-turkey without (Fill In the Blank) in 3-2-1…. While that is OK in some respects, it is not necessarily wise. Even doctors advise you to taper off gradually from meds and habits that may have a physical response if abruptly shut down. Now I realize that social media is not meds, but the chemical response that social media gratification produces in the body has the same consequences if significantly reduced or removed without a tapering off period. Well, I did all of the above without tapering off with Facebook. I am going without Facebook for Lent. I have not given up Twitter, Instagram or LinkedIn because I choose to remain informed by, yet detached from, social media. Why Facebook (FB) and not the rest? Why now? FB is my first social media account. It is where I have the most friends, with the most content. It is the platform for my diatribes and claps-back at people. I have all of my other social media accounts to feed into FB. I have my community there. Its…well, its home. Why now? Now is good because it coincides with Lent. That creates a goal with dates of achievement. A goal without dates is just a dream. The dates of Lent create a parameter for my brain. So in preparation for leaving FB, my brain was telling the rest of my body.. .”Don’t panic! It is only for 40 days.” Without this parameter, anxiety and stress would set in, others parts of your mind (the self-gratifying side that loves to see the number of responses that you have to the items that you posted) would start the fight or flight language; you can’t do it…it’s Too much, what about your friends (Note the TLC reference)? What about your hashtags (the pleading verges on the ridiculous), what about the political rants (will not miss those at least I don’t think so), what about…. But parameters set up the boundaries. 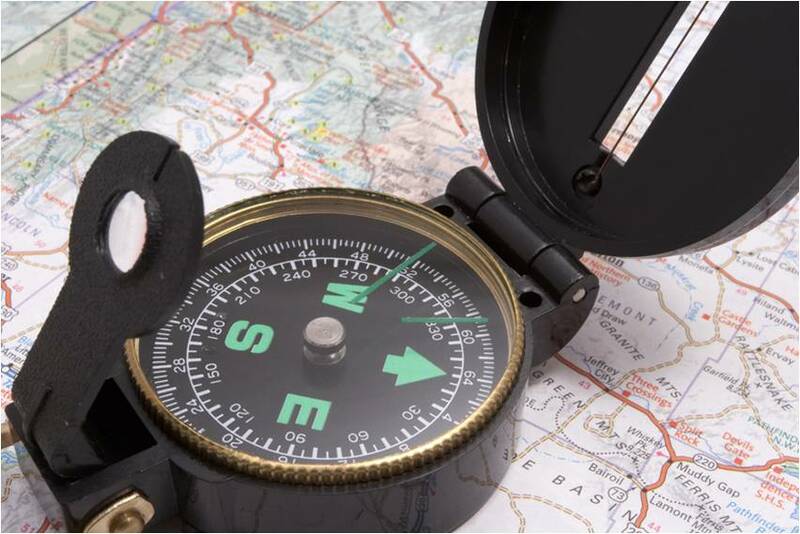 Boundaries help to define your life and regulate time. And with FB inside my boundaries, it was overtaking my life to a certain extent. It had become my life, from a social media perspective. I do enjoy seeing and hearing about what’s happening with everyone (thanks for the commentary on the Grammys and the Oscars,) but from a time perspective, it was encroaching on my day. The time reference, of course, is in retrospect as it has only been 12 hours since deletion and 8 of those I have been asleep. It is almost paralyzing. When you make a decision to remove something or someone from your life, the first few hours and days, you are extremely cognizant of it not being there. You begin to see how much it was a part of your everyday existence. FB has been just a reach away for so long. Nightly, on the side table for when my alarm goes off, or I can’t sleep…the red numbers beckon me. Early morning before I shower, scrolling just to play catch-up. I have friends in other time zones. When I drop the kids off at school, I do just a quick check because I may need to respond. Intermittently during work, when I am in the restroom, during my lunch break, as I wait in line to order food. It is incessant. This morning was different. Last night, after my final post on FB I deleted the app from my phone. And I second-guessed myself through the entire process. I was in full panic-mode. I truly didn’t know if I could do it. The one saving grace was merely this…”I had made a promise to myself and declared to my FB world and. It SHALL BE DONE”. That is a great thing about putting things out in the universe; it makes you accountable. You are responsible for yourself first and the veracity of your words. Second, when you give voice to your plans, you enlist the universe and God (Insert your deity as necessary) into helping accomplish that which you have spoken. The power of your words is astounding, whether for good or evil. It is so important to be mindful about what we are speaking over ourselves and others. For Death and life are in the power of the tongue: and they that love it shall eat the fruit thereof. Proverbs 18:21 (KJV). However, back to the point. This morning was different. My routine was the same, however, instead of spending 20 minutes scrolling, posting, and replying, I scrolled quickly through Twitter (you may see some retweets), and I was into the rest of my daily routine. It was invigorating. I had redeemed the time and was mentally preparing for my day ahead. I had gained focus! The point I am making is this: it is easy to lament what you give up, however, what you learn or create as a result may be well worth the loss that you experience. I am still having withdrawals and trying to discover what other productive things can be done instead of lamenting the lack of scrolling. And here is a note of caution: I will not replace one questionable habit/addiction with ANOTHER!!! But know this; the possibilities are endless! Option # 1 “Back to Blogging!” That’s a good, positive habit to have. Here are some of the outtakes, or bloopers if you will, from the Tackling WPW blog. I would have loved to have them in the original post, but it just made things too long. Some are funny and some are meaningless! Enjoy! Arielle’s cardiologist, Dr. Black and his staff were instrumental in getting everything scheduled so that Arielle could have everything handled in one trip. You see, the electro-physiologist, Dr. David Bush was in San Antonio, as is Dr. Black. And we are in El Paso. Dr. Black is the cardiologist for Fort Bliss and has two regular appointment days monthly in El Paso. The nail that pierced my tire. The date was set and the travel determined. Arielle and I piled in the Suburban and hit the road. San Antonio is about eight hours from El Paso. 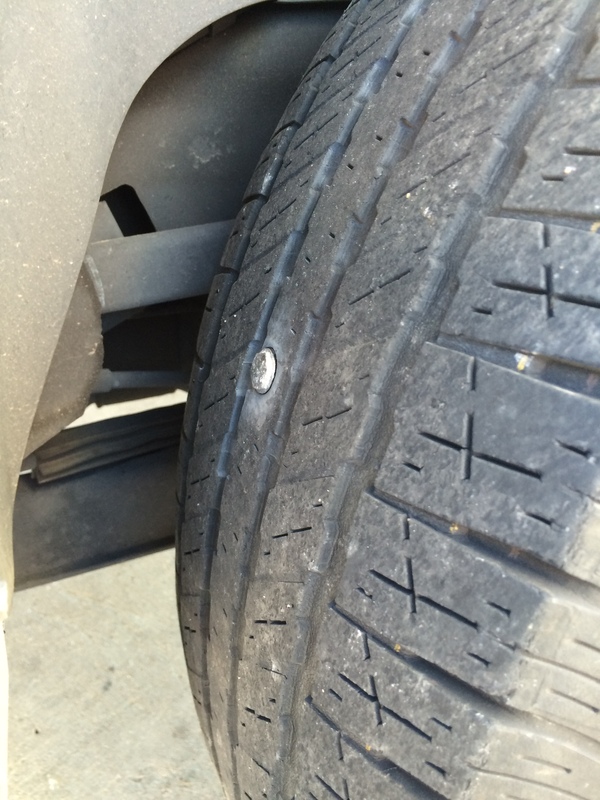 The trip was uneventful with the exception of a nail in my tire that had to be repaired before even leaving El Paso. Did I assign that as an omen of things to come? Nope. This was literally a trip of a lifetime. This trip would change Arielle’s life forever. She would go from having a possible life threatening syndrome and ending her sports career to being free to soar to heights uncharted on the other side of this procedure. I was elated and anxious. While Arielle was in San Antonio, her high school volleyball team was competing in a pre-season tournament in Corpus Christi TX. They all knew of Arielle’s diagnosis as she was unable to practice with the team for the two weeks leading up to the procedure. They really missed her on the court. To see Arielle’s volleyball skills, check out this video. 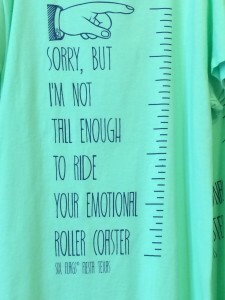 When we arrived at Six Flags we were both a little perplexed at our behavior. Since both Arielle and I are self-professed roller-coaster junkies, why are we not riding?!? Truth be told, we didn’t trust her heart to hold up. The procedure was looming and we were now well aware that she was at moderate risk with the WPW. We were afraid that she would be scared to death. We walked for a while in 100+ degree heat and then finally settled on the Poltergeist as the first ride. It was a good ice breaker. Arielle realized that her heart would hold up primarily because she was bored with the ride. The Poltergeist had no real thrill factor for her. That set us off on a quest. We were looking for the ride that would deliver the thrill. We were in the hunt. Since it was a Thursday, the lines for the rides were fairly reasonable. So we hit it–hard. We did Superman, Goliath, Boomerang, RoadRunner, the Iron Rattler, the Sky Screamer and then finally Batman. The ultimate test of a roller-coaster’s thrill for us is how you look on the picture that is taken and what exclamations or screams escape your lips as you ride! Arielle smiled on all of the ride pics! I did well on all but one. The Iron Rattler was on for the ages! That one almost had me in need of a motion sickness pill. It was a great time and it kept our minds off of the WPW procedure. After the park, we went and had a huge meal at Pappadeaux’s . This was going to be Arielle’s last meal before her procedure and I wanted to make it memorable. We had everything from appetizers to dessert. Arielle had her three favorite things, lobster, shrimp and pasta. She had the Lobster Mac & Cheese appetizer and the shrimp pasta entree. Definitely memorable! In the midst of this flurry of activity, Arielle feels the need to go to the bathroom. Since the procedure required entry in her groin, she couldn’t sit up and go to the bathroom the regular way, so Nurse Jennifer brought her a bed pan to use. It is very awkward to use a bedpan when you have use of all your faculties, but it is even more so when you are partially anesthetized and required to lay flat on your back! Arielle had no success with the bedpan even after 3 tries! The bladder was just not cooperating. Arielle was upset because she really felt the need to go. She said It was at the point where her sides were hurting. But, being the typical teenager, she didn’t want to pee in the bed. Nurse Jennifer told her it was fine to pee in the bed that they would clean it up, but Arielle was not EVEN having that! Then Nurse Jennifer offered a diaper since she didn’t want to wet the bed. I interjected and opted for the diaper. So Arielle was getting a diaper…NOT! Nurse Jennifer came back and said that they did not have diapers big enough for Arielle. She did offer to fashion a “ghetto diaper” out of the moisture pads that they place under you to protect the bedding. She was just about to do that when the crew came in to take Arielle back downstairs. I am not sure if Arielle was relieved to not get the ghetto diaper or not because she still really had to go! Nurse Jennifer let Nurse Keri know about Arielle’s urinary dilemma and Nurse Keri said she would handle it downstairs. By “handle it” she meant put in a Foley catheter. When Nurse Keri came to get me from the waiting area she told me that Arielle REALLY did have to go badly. She utilized the catheter quite nicely. And by nicely I mean filling the bag to near capacity! Afterwards when Arielle woke up, she checked herself and realized that she had the catheter in and said “Mom! There is something in my V-Jay-Jay!” I explained to her that it is not in her V-Jay-Jay as she so eloquently put it, but it was what was helping her to go to the bathroom in lieu of the ghetto diaper! Now I had to get an appointment at the clinic. I called the Appointment services for Fort Bliss and was offered an appointment on September 9th. Are you kidding me?!? Unacceptable. The appointment rep told me to call back on Tuesday 8/25 to see if I can get an appointment for Wednesday. So I did. I called the appointment line Tuesday 8/25 the minute they opened at 6:45am. Again I was offered September 9th. Again I said unacceptable. I told the appointment rep that I needed an appointment today, 8/25 or tomorrow 8/26. He looked had me on the phone for 7 minutes looking for an appointment. I finally got an appointment for 8:40am on 8/26. It was with the same provider that started us on this journey. AND it was earlier than it would have been with Dr. Black! Win-Win! I knew that the provider would have no problem doing what was required to get the EKG to Dr. Black. She was VERY familiar with Arielle and her story. She almost had a vested interest in getting her cleared for sports. When we met with the provider, we gave an update of the procedure. Then she put in the order to get an EKG done and to have it faxed to Dr. Bush. We know the EKG routine now and it’s not as scary as it was on the front side of this situation. At first we were hoping that nothing was found and we are still hoping that nothing is found, but for a very different reason this time. Finding nothing means everything this time. We waited and waited to be called to the EKG room. Our nerves were still on edge because of what happened while in San Antonio. The EKG was done and we left. Both Arielle and I were still uneasy, because it just seemed like the med tech didn’t do the EKG right. She just did not know what was riding on this EKG. One slip up and we are in trouble. Now we just had to wait for the final review by Dr. Bush. I contacted the office to make sure that the EKG fax had been received. But Dr. Bush would not read the fax on Wednesday. He was in Laredo doing screenings. He would be back in the office on Thursday to read the EKG. So we had to wait ONE More Day. The bad thing about waiting the one day means that she would not be quite ready to play in the volleyball tourney in Wofford TX, the weekend of August 28th – 29th. She was allowed to attend the tourney because her discharge paperwork said that she was able to practice but not released to compete. So I am waiting to get the clearance so I can get it to the trainer, so he can get it to the coach, so she can take the court with the team on Friday morning. Talk about cutting it close! Once Arielle’s official clearance was received from Dr. Bush and sent to the trainer, it was discovered that Arielle had not turned in her physical form. 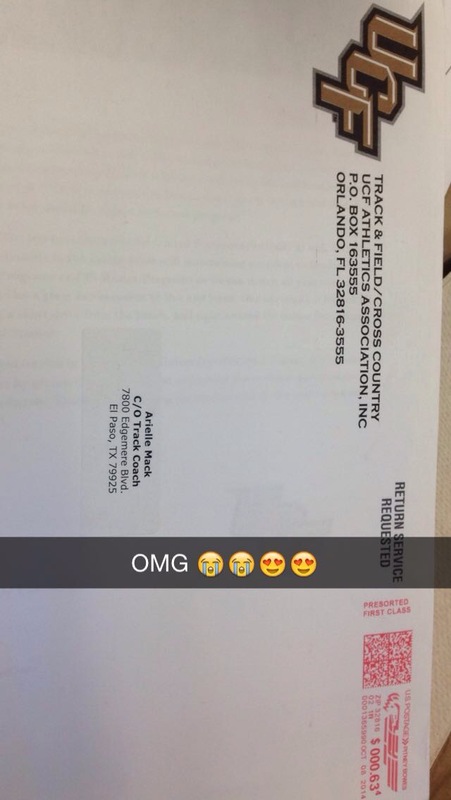 This meant that she would not get clearance from the trainer to compete until it was turned in. But she is already in Frenship suited up and ready to go! Unaware of any of this, I am driving my son, Benjamin, to school when my cell phone begins to go crazy. First it’s a text from the trainer requesting the physical. I have it so I will email it. Then I get a call from the Coach. OK I relay the same message. I will email it in 30 minutes. Then she says, “but we are warming up right now.” That’s when I realize that they are on Central Standard Time in Lubbock and not Mountain Time, thus 1 hour ahead. Oh Snap! 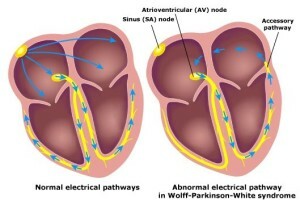 Wolff-Parkinson-White Syndrome (WPW) is a condition in the heart where there is an extra electrical pathway within the heart. 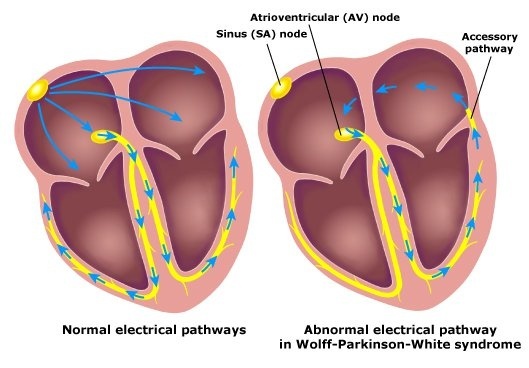 The challenge with the extra pathway is that it allows the electrical pulse that causes the heart to beat to enter into the heart’s valves unrestricted. This unrestricted electrical pulse can cause rapid heart rate and possibly sudden death if unchecked. WPW is of even greater concern for athletes who push their heart rates to exorbitant levels to be the very best in their sport. Arielle is that athlete. She works her body in volleyball and track to be the very best. She is naturally athletic, but she does not take that for granted. She constantly strives to be better. Once Arielle received the official diagnosis of WPW, she made the decision to go to the USATF Junior Olympic Nationals in Jacksonville. She made the choice in spite of the diagnosis because she had a score to settle. She did not make All-American in 2014 at Nationals in Houston TX and she wanted some vengeance this year in Jacksonville. And WPW was not going to keep her from it. 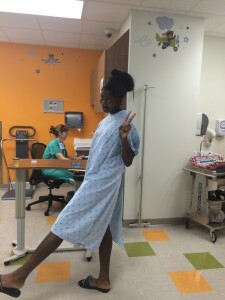 However, now that track season had finished with her redemption at Nationals, and high school volleyball season was at hand, we made plans to have the cardiac ablation procedure that would make WPW history once and for all for Arielle. Our first appointment was a consultation with the electro-physiologist, Dr. David Bush. Dr. Bush would be performing the procedure on Arielle. He talked with us about WPW and particularly about Arielle’s case. He put her in the “moderate risk” category because she was an elite athlete and he saw the results of her Holter monitor diagnostics. Her max heart rate during diagnostics was 174 beats per minute. He assured us that doing this procedure was definitely in her best interests. Our final question before leaving the consultation…can she go to Six Flags Fiesta Texas? 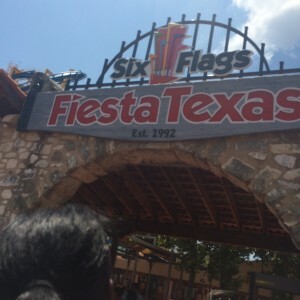 With a resounding “Yes” we were on our way…out of the consultation and on to Six Flags! Procedure day was met with palpable apprehension. D-Day had arrived. This was the day that Arielle would reclaim her sports life, but the angst about the unknown left her non-plussed. Since Arielle couldn’t eat after midnight before the procedure, she skipped breakfast and slept in. I quietly ate and silently prayed. This was a big day. We packed up our hotel and headed to the hospital. Travel to the hospital was awkward. I knew that Arielle had tons of questions that I had no answers for. We joked a little as we let Siri navigate the route to the hospital. Upon our arrival, we parked and went down to the cath lab. We checked in and sat down. Keri, the nurse who would be assisting in Arielle’s procedure came in to put a numbing agent on the area where the IV would be placed. They were finishing up another patient and would get to Arielle soon enough. Arielle is not a fan of pain or the unknown, so I know that waiting for this procedure was really taking its toll on her. Even as a toddler, getting her to cooperate with her pediatrician or to get a shot called for some very creative thinking to get it accomplished! But she toughed it out because she understood that it was for the greater good. That’s the power of being a disciplined athlete. She knows that practice, repetition, weight training and core workouts are necessary because she understands that those things the keys to a great season, that greater good. This procedure would lead to greater good in her athletics. I just simply prayed and stayed in faith. I refused to let my mind stray to the “what ifs”…. Soon, Keri came to get us to get Arielle prepped for the procedure. Arielle changed into the ever-so-fashionable hospital gown got her IV put in. Arielle hates needles, but she is too nosy not to look at what is going on. So since she hadn’t eaten since 10pm the night before, I thought it prudent that she not watch the IV go in because she might faint. So I had her look at me and talk so she wouldn’t be tempted to look. The entire procedure crew was very nice and supportive. They were awed by how tall Arielle was and her athletic accomplishments. Apparently it was all the talk about this elite athlete coming in to get this procedure done. After all this was the pediatric unit! They actually had to extend her bed to its maximum length to accommodate her length. They gave Arielle some happy juice to get her relaxed and that set her off in a fit of loopy giggles. I gave her kisses and she was wheeled away and I was taken to the waiting area and given instructions on how to contact them. The time was 1pm. I went and got my laptop and some lunch and proceeded to start my blog. The procedure was scheduled for anywhere between 2 and 4 hours, so I got comfortable. About an hour or so later, Keri called give me an update on Arielle’s progress. She was doing well and Dr. Bush had isolated the alternate pathway. Still prayerful, I continued to work on my blog. Shortly after that, around 3pm, Dr. Bush came in to say the procedure was complete and in about 20 minutes they would be taking Arielle upstairs. I packed up and was going to see my baby. Keri came and I actually rode up to the 9th floor with Arielle and the team. She looked good, but of course she was still anesthetized so she was oblivious to me or her surroundings. They got Arielle in her room in the pediatric cardiac ICU (PCICU) and I was settled in with her. It was around 3:30pm. As I watched her sleep and looked at her vitals, I saw the blip in the EKG that was noticeably absent when we started this journey. I began to let my guard down. It was finally, FINALLY over. Just needed time to recover and this whole ordeal would be a thing of the past. Yes! At around 4pm I looked at her vitals and noticed that the blip seemed to flatten out and disappear…just like in the beginning…but I am not a doctor but it didn’t seem right. Shortly after my mental assessment, one of the nurses came in and was on the phone with someone. I would later learn that it was the tech team that was assigned to monitor patient vitals. The nurse looked at me politely but an urgently concerned line etched her face. I listened to her end of the conversation…”No it doesn’t look like a delta wave…it can’t be that…yes I will call him.” My guard immediately started easing its way back up. What now? The nurse took pictures of Arielle’s vitals. She explained that she was sending them over to Dr. Bush for review. The medical technician came in and took another EKG. Arielle was oblivious to it all of this activity because she was still under the anesthesia. There was a flurry of activity that had me on high alert. There was something not right with my child and the fix that was supposed to change everything. I say OK and then wait. At around 5:30 Arielle begins to come around. She starts to move and is a little perturbed by her discomfort. She is in and out of drowsiness so I didn’t try to explain to her what is about to happen to her again. So back downstairs we go. It’s about 7pm. Arielle is still groggy and needing to go to the bathroom. I am putting on a brave face and trying to find that courage that had kept me up to this point. It was eluding me. My armor had been pierced and I didn’t know if I would make it this go round. All my reserves had been tapped and I was operating on fumes. I was not scared or worried, but I was very, very concerned. After the initial ablation, Dr. Bush had let me know that the alternate pathway was very close to the original pathway and if he accidentally ablated the original pathway, it would cause heart block and that would end Arielle’s athletic career. Not restrict it—END it! And now he has to go back in. It is of great concern for me. I am in the waiting area and I feel absolutely alone. I am shaken to my very core. Tears are pooling, but I cannot let them fall. If one falls then there would be an uncontrollable deluge and I have to be there for my baby. I have to be able to be her rock no matter the outcome and God knows I am believing for a positive outcome. All of my external forces were showing signs of weakness, but my internal man was the prisoner of a positive expectation. I had to hold on to that hope that made me schedule her physical believing that no cardiac issues would be found. I needed that same hope that sent us to Jacksonville and allowed her to compete in spite of WPW. 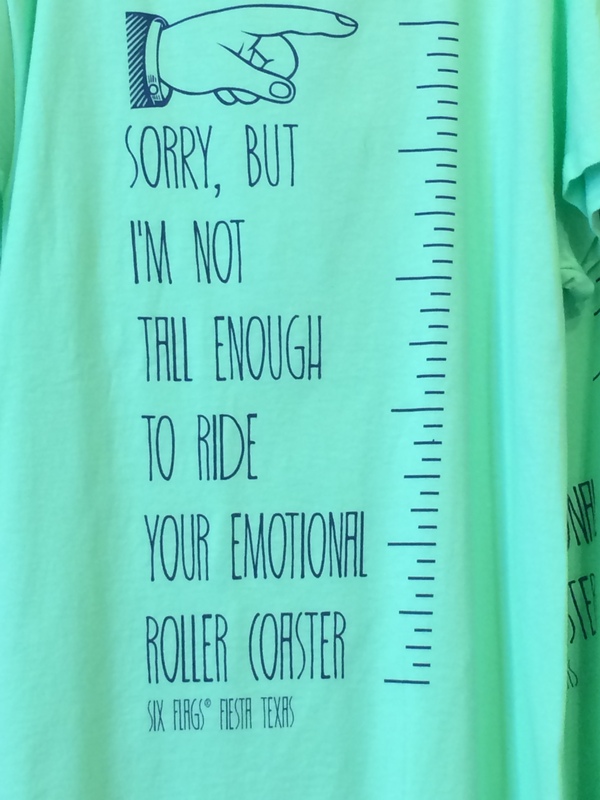 I needed that hope that put us on every roller-coaster at Six Flags. For I walk by faith and not by sight! So although my armor was failing and there were stress fractures in my thoughts, I still knew that it was going to somehow, someway be alright. It had to be. I got a phone call from Keri saying that the lesions were done and they were doing tests. These tests involve introducing medicines into the body to give the heart adrenaline spikes so that they can check where the electrical pulses are traveling. This goes on for quite a while to make sure that the pathway is completely closed. By 9:30pm Arielle, the team and I are taking the ride back up the elevator to her room. She is heavily sedated and still intubated. I couldn’t even look at her. My armor was almost completely useless at this point and I felt way too vulnerable. Through the night, Arielle’s vitals remained normal and she showed no signs of reversion. An EKG was taken the following morning for Dr. Bush to review prior to discharge. Things were fine and the pathway was completely shut down. She still had to recover and was not completely released to go back to sports. Final clearance for competition would come when Dr. Black saw her in El Paso on August 26, 2015. That was the best news ever. We were ready to head home. But first Arielle needed to use the bathroom normally before she could be discharged. The nurse helped her to sit up on the bed. Once she overcame the dizziness of double doses of anesthesia and 30 hours without food she was able to use the facilities. This was her “Get out of Jail FREE” card! We went to breakfast at IHOP on our way out of San Antonio. It was raining but I wanted to get Arielle some food so that her systems could start recovering. She was still pretty drugged up and unsteady and it took some getting used to seeing Arielle in that state. It took Arielle a little bit to get used to being in this state too. She is very independent and having to hold on to your mother for support was a bit much. As we were eating breakfast, I look up and see Arielle in tears! Intrinsically I knew. Finally, she had allowed herself to be overwhelmed by her situation. She had finally allowed herself to look over the edge of the cliff and into what might have been and to know that it was over. It is Over. It’s O-V-E-R! I went over to sit with her, put my arms around her and just let it happen. No explanation necessary. No conversation required. Who cares that we are in IHOP. If they only knew… Over and done! Not ANOTHER “But”! This cannot be happening! On Monday 8/24 I receive a call from the clinic to say that they are cancelling all of Dr. Black’s appointments because he is unable to come in from San Antonio. Then I am told that Arielle is being referred out to network and I should receive a referral letter in the mail in 7 days…. I heard nothing else after that. Seven days to wait to get a referral to a doctor who would then take a few more days to get me an appointment. And while this is happening, Arielle is unable to get back to volleyball. Absolutely not! I thanked the nurse for the bad news, told her it was unacceptable but not her fault and came up with my own plan B. I immediately called Dr. Bush’s office, spoke with his nurse, and set another plan in motion. I got a prescription from Dr. Bush to have the EKG done here at the clinic and to have it faxed over to him to be read so that he could clear Arielle. When we met with the provider on Arielle’s appointment day, 8/26, we gave an update of the procedure and how if it had not been for her looking for Marfan Syndrome the WPW would not have been discovered. Then she put in the order to get an EKG done and to have it faxed to Dr. Bush. We know the EKG routine now and it’s not as scary as it was on the front side of this situation. At first we were hoping that nothing was found and we are still hoping that nothing is found, but for a very different reason this time. Finding nothing means everything this time. As of the writing of this blog…Arielle is 100% cleared! Back on the court and back in the game! Check out he WPW Outtakes blog. It has additional content on the WPW journey that I did not include here for the sake of your attention span. We have all been there and we have all witnessed it…That moment when your child has an awful performance when he/she should have had their best. The meltdown is brewing just under the surface and you have to help your child save face. Here is a list of 10 things to help your child get through “the bad performance” meltdown moment. 1. Remember: This is NOT about you! I know you feel badly for your child and you wanted so desperately for them to do better. It pains you to see your child in turmoil, but he/she has just endured what feels like the upset of a lifetime…your focus is on them. You can grieve later. 2. Get someplace private quickly. My vehicle is my place of choice. No distractions, semi-private, and can be moved to a more secluded area for additional privacy. **NOTE: DO NOT drive while doing these steps! You must be fully present in the moment and give your child your undivided attention. Your child’s mental well-being depends on you in this moment. FOCUS on them. 3. Give your child room and permission to let it out. Let them know you are there to listen then keep quiet and do it! How you feel about what he/she is saying is not important. Your child is entitled to their feelings. 4. Don’t rush the moment. Give it time. Let them find their own words. No prompting. I know the silence is deafening and you want to fill it with all the many quips, quotes and “isms” to make it all better. NOT NOW! This is your child’s time. Do not attempt to console them or make it better. Trying to console them is our selfish attempt to assuage our own discomfort at their situation. It does not help the child. 6. Listen to them! Really engage. It is their moment, their feelings. Remain focused. Being distracted will damage trust if he/she asks you a question “mid-vent” and you haven’t been listening! Make mental notes of things that you wish to clarify AFTER the venting is complete. 7. Correct erroneous, derogatory or self-deprecating comments that your child makes about him/herself. Those must be addressed immediately. Interruptions, at this point, are allowed, but do not steal the floor. Help him/her distinguish themselves from the event. 8. Give them time and opportunity to grieve the moment. I allow my child 5 minutes to do whatever he/she needs to engage and express the intense emotion that comes with a loss or disappointment. She can scream, cry, roll around on the floor, jump around, yell or punch a pillow. Profanity, self-inflicted pain, and property damage or destruction is NOT allowed. Teach appropriate behaviors for dealing with grief. While watching your child rolling on the floor may make you uncomfortable, it is a lot less painful than other things that your child may find to numb unexpressed pain later on. This can become quite the comical moment, but try to remain focused on the gravity of the situation. At about 3 minutes she begins to feel silly because it doesn’t hurt anymore. **NOTE: It is important that you emphasize that once he/she has this moment to grieve, that the pain and emotion of the situation is over. The event can only be revisited and used as a learning tool, not to be worn as a badge of one’s inferiority. 9. Wash away the physical residue of the moment/event. Once she is done with the grief, then it is time to get some comfort food, a good movie, ice cream, a hot bath or whatever lifts the spirit to a happy place. Even meltdown moments have flashes of brilliance. Emphasize the good in the midst of the bad so that your child knows that all is not lost and he/she WILL live to perform another day.